Coupe life can be fun but rarely practical: if you love the Mercedes-AMG GT Coupe, but need more space to transport friends, family, or sports equipment, the 2019 Mercedes-AMG GT 4-Door Coupe may well fit the bill. While you may or may not be down with the recent trend of calling cars with four doors “coupes,” there’s one thing I found you can’t argue with. Somehow – with the help of the base model GT 53 4-Door Coupe – Mercedes-AMG has managed to make some of the most practical, yet outrageous, sports sedans that money can buy. Your attention naturally goes to the most extreme version, the 2019 Mercedes-AMG GT 63 4-Door Coupe. Under the hood is a handcrafted AMG V8 motor that churns out 577 horsepower and 590 lb-ft of torque. The GT 63 S gets even more outrageous, with 630 horsepower and 664 lb-ft. No word yet on official pricing for this 600-horsepower family rocket, but Mercedes was blunt with me that, if you can afford a $200k Porsche Panamera Turbo S, you should probably be cross-shopping. When you’re letting around 600 horses out to play, you’d best have plenty of space to do it. 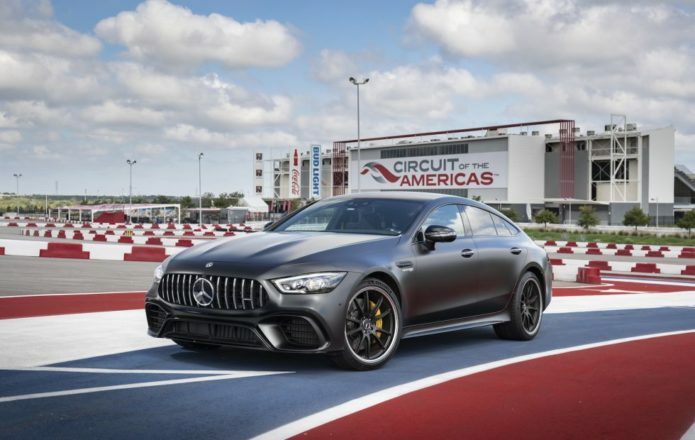 Mercedes-AMG opted to take the GT 63 S to Circuit of the Americas (COTA) so that we could test out its talents. It’s a course with plenty of twists and turns, along with major elevation changes that challenge both professional drivers and the depths of torque your vehicle-of-choice can bring. The power is certainly there, as you’d hope, but there’s a surprising degree of control, too. Keeping the basic concept of slow-in, fast-out in mind, with the long back straight approaching I variously tried coming in hard, soft, and “just right” to see how the AMG would handle it. 0-60 mph arrives in a mere 3.1 seconds, and with the AMG Dynamic Select system set to Race Mode the GT 63 S pivoted around the turn and galloped on to set my personal best of 158 mph on the straight. Plenty of noise, yes, an no shortage of speed, but all delivered with astonishing poise. That’s partly down to how AMG constructs the V8 engines, putting the twin-scroll turbochargers in-between the cylinder banks rather than outside of them. It means they’re closer, and that makes them more responsive: there’s less tubing for the exhaust gases to travel down, and by putting the catalytic converters within the “V” too, AMG improves on thermal efficiency as well. The result is terrific throttle response with better power delivery, even at low revs. Going fast, then, isn’t going to be a problem. With a curb weight of over 4,460 pounds wet, though, making sure the GT 63 S would stop at the other end did give me a moment’s pause. For that, Mercedes-AMG opts for internally-vented, perforated 15.4-inch x 1.4-inch carbon ceramic brake discs at the front, with 6-piston aluminum fixed calipers, along with 14.2-inch x 1.0-inch carbon ceramic brake discs in the rear, with single-piston aluminum floating calipers. Even after a whole day of hard treatment, not once did I sense that the brakes were giving out or fading. Michelin, meanwhile, delivered some specially formulated rubber, giving the GT 63 S a set of 265/40/ ZR 20 tires on the front and 295/35 ZR 20 for the rear. What’s important is that they’re not just track-day specials. The AMG GT 4-Doors may be fast, but they’re also meant to be family haulers. That meant the tires had to be capable of dealing with everyday road conditions, like smoothing out bumps and avoiding road noise and vibration. The last part is aero. Most noticeable is the active rear spoiler, integrated into the trunklid. Not only does it extend when required and retract when not, it has five different stages of deployment, all controlled automatically depending on vehicle speed. At up to 49 mph, for example, the spoiler rises to improve on downforce and aerodynamic efficiency as the car accumulates speed. Stage 2 comes upon reaching 87 mph, to boost downforce, while Stage 3 doesn’t arrive until 161 mph, delivering maximum downforce and stability. Stage 4 comes in at 112 mph, when you want the perfect combination of airflow and stability for high-speed cruising – not that you should ever see it, legally at least, on US roads. Finally, Stage 5 delivers the maximum extension to act as an airbrake, helping you when you’re slowing aggressively. I may not have seen Stage 3, but COTA still offered a variety of challenges and obstacles to put the GT 63 S through its paces overall. One of my favorite sections – and a part that can be particularly cruel in highlighting any balance questions a car might be suffering – is the performance handling section. You enter the chicane at a fast, sweeping left hand turn with a slight decrease in elevation, after a hike uphill. It’s enough to upset even the most adept cars’ balance, but Mercedes-AMG’s 4MATIC+ all-wheel drive and rear-wheel steering chewed through it without problem. At lower speeds, the rear wheels turn in the opposite direction to those at the front, reducing the turning circle. It’s particularly useful for maneuvering around tight parking lots. At higher speeds, though, the rear wheels turn in tandem with the front, adding to the feeling of stability and helping the GT 63 S feel stable and planted through fast-paced sweeping bends. Germanic perfection isn’t forced on you, though: in Race Mode you can still provoke some drift through the slaloms, though I never once felt anything other than in control. It is, you could argue, easier to make a super-expensive performance car with no compromises than it is to craft a more affordable version that still doesn’t stint on track talent. With that in mind, I turned my attention to Mercedes-AMG’s other GT 4 Door option, the new GT 53. Gets a 3.0-liter turbocharged inline-six, producing 367 horsepower in the GT 43 and 435 horsepower in the GT 53 model. Far less than the GT 63, certainly, but then you pay far less, too: another option is the GT 43 will start at under $100k, while the GT 53 will come in at around $130k. Sure, those prices still aren’t “cheap” by any means. It’s also unclear if the GT 43 will make it Stateside, either. Yet in the context of the rest of the performance market, these could be bonafide bargains. The obvious competition is the Porsche Panamera Turbo and the BMW M6 Gran Coupe. The fastback silhouette of the Mercedes looks strikingly similar to the enhanced styling of the 2019 Porsche Panamera. However, the Mercedes has a more aggressive fascia than both the BMW and the Porsche. I suspect the Audi RS7 might be looking over its shoulder, too. Then there’s Mercedes’ very own CLS Coupe. Based on looks alone, it’d be easy to assume the GT 4-Door is based on the CLS platform, but you’d be wrong. In fact, the new car uses the MRA architecture of the current E Class sedan. To that, the Mercedes-AMG team adds a sleek and sporty body, with a ridiculously raked windshield and a low-slung silhouette to create the GT 4-Door. Squint, and the coupe proportions the name promises are all there, including the long hood and the sloping rear profile in the rear. Mercedes avoids too many CLS comparisons with its oversized grille with vertical bars, and AIRPANEL air control system in the front apron, and the chunky rear diffuser. The GT 43 and GT 53 don’t have a “V” to put their turbochargers in, but they do get a mild hybrid system. EQ Boost uses an electric motor that doubles as the cars’ alternator and starter. Mounted between the engine and the transmission, it feeds the AMG’s 48 volt electric system, but can also contribute a short-term boost of power and torque equal to around 22 hp and 184 lb-ft. It works in tandem with the two-stage turbocharging, with the mild hybrid system kicking in as the turbo spools up. The outcome is an immediate rush of torque with no perceivable turbo lag, but also a turn of raw speed that befits the AMG badge. In the GT 53, it pushes maximum torque to 384 lb-ft and helps deliver a 0-60 mph time of 4.5-seconds. That’s a properly fast time for a large family sedan. Top speed arrives at 177 mph. With all that focus on power and speed, it seems a little perverse that one of the biggest selling points of the Mercedes-AMG GT 53 is its fuel consumption. Even when equipped with the standard 4MATIC+ all-wheel drive system and the AMG SPEEDSHIFT 9G automatic transmission, it’ll apparently manage around 25 mpg on the combined cycle. That’s not bad at all for the segment, even if US-spec cars will only get seating for four, not five. Nice as it might be to stay on the track all day, eventually the 2019 Mercedes-AMG GT 4-Door has to venture onto more humdrum asphalt. It’s down to the AMG Dynamic Select Function to bring the beast in line, adjusting the engine, transmission, suspension, and exhaust behaviors accordingly. Switching to Comfort, the suspension gets noticeably more supple and the flaps in the exhaust system are closed, tempering the soundtrack unless you lean hard on the accelerator. The AMG Dynamics handling is adjusted to Basic mode, prioritizing higher yaw damping for flatter cornering. For a little more enthusiasm, there’s Sport mode. Shift times are trimmed, and the engine tuning and throttle response are more aggressive. The ECO start/stop function is disabled, too, while the AMG Dynamics control shifts to Advance mode to strike a balance between ride, handling, and agility. Stiffer suspension sacrifices a little ride comfort in the name of cutting body roll even further, not to mention improving handling when cornering. The end result is that performance on the road is as good – or indeed better – than you’d imagine for a sports car with four doors. That’s a big enough differentiator as it is, between the AMG GT 63 S and the C63 S. Minimal road and wind noise, combined with a smooth ride, leave a sense of luxury whether you’re behind the wheel or being driven. If you’re in the enviable position of shopping for a potent four-door sedan, as much at home hauling people around in style as it is being let loose for a track day, it’s worth your while considering Mercedes’ latest offering. Although rear-wheel drive fans may still want to look to the AMG C 63 S, anybody with the Porsche Panamera Gran Turismo or the BMW M6 Gran Coupe on their shortlist would be remiss to ignore this new AMG super-four-door. After all, it drives just as aggressively as it looks.